April and this first week of May have probably been some of my favorite weeks of pregnancy! I look pregnant, and I certainly feel pregnant. I'm loving that dresses have become the norm with the arrival spring and almost summer temps. But my absolute favorite part of this time of pregnancy is the constant reminder of this sweet baby's presence with his precious kicks and flips. Since I broke my promise to myself of doing weekly bumpdates, I'll squeeze three weeks together into one, happy post of pregnancy updates goodness. Movement: Yes! As I mentioned, I am loving feeling this precious boy kick and flip till his little heart's content! And, during week 23 (Monday, April 20th, to be exact! ), we had a little cramping scare (that ended up being nothing concerning our little guy!) that left us both home from work and together when we first were able to feel his little kicks from the outside. I was laying in bed when I felt it, and called for Kyle, who came running in because he misheard "I feel the baby's kicks" as "I feel sick!" It was such a sweet moment, and I'm so happy Kyle has finally been able to experience the joy of feeling our son move! He's even had the chance a few times since then, and we're excited for the upcoming weeks when we should be able to feel (and see!) him moving more from the outside! We took this right after Kyle felt the kick for the first time! Sleep: So much better once I got my hands on the Snoogle and we switched to a memory foam mattress topper! I'm sleeping like a baby except for the fact that I am up at least 2, if not 3 times a night for pee breaks. I guess it's good practice for being up once the baby comes! 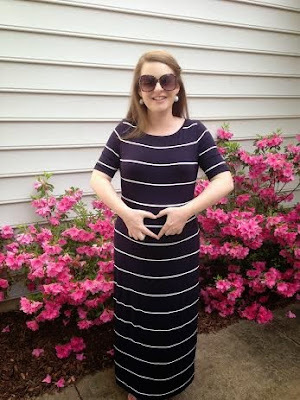 Maternity Clothes: Mostly living in non-maternity maxis (thank you Old Navy and Loft!). Also, loving a pair of borrowed Liz Lange maternity skinny jeans from Target (thanks, Kelly! ), and a pair of white and a pair of black maternity skinnies from Loft mixed with non-maternity tops. :) I did invest in a couple of camis and tees in larger sizes, and cardigans in non-pregnancy size but in Tall for length, which has helped! And, as I mentioned in my last post, I did buy two pairs of pj shorts from Old Navy in a larger size to accommodate this growing bump! Symptoms: pee breaks all.the.time., some mild swelling in my ankles, super thirsty, some hip pain when I wake up from sleeping (not nearly as bad as it was before we switched mattresses, though! ), and occasional heartburn. I've also randomly had nosebleeds, which I never experienced before pregnancy. All that fun stuff! Nursery: We have finally started to make a little progress! Our office is now in the process of being changed into the nursery. Kyle's brother was kind enough to come help move furniture and rearrange some of it into our guest room. We chose a paint color (Benjamin Moore, Smoke Embers) and are excited to paint later in May. Kyle's mom has been kind enough to let us have this adorable dresser that she painted a turquoise to act as the changing table, and we have a crib and glider picked out, just not yet purchased. We also ordered a "pouf" from World Market, which I had never heard of before, but I love it! And, we know what we want to do on the walls and have chosen crib bedding from PBK. We're excited to see it all come together, but we have a long ways to go! Hubby: Kyle seriously melts my heart daily. He loves to talk to my belly, and most every night he reads a book to the belly bump and we sing a lullaby called "Candlelight" that my grandmother sang to my mom who sang it to me. Kyle also loves to play music for our little nugget with the belly buds. His "I Love you" texts now extend to "I Love you and the baby." We also had always talked about wanting to start an email address for our each of our children so that we could send them emails throughout their years and give it to them on their 18th birthday. Kyle set one of those up as soon as we chose knew it was a boy and chose his name (more to come on that later! ), and we have enjoyed sending him a few emails already! Kyle is just going to be the best daddy ever! And, he is just so kind and caring towards me. I seriously did not think it was possible to love him anymore, but fatherhood has certainly taken it to a whole new level. 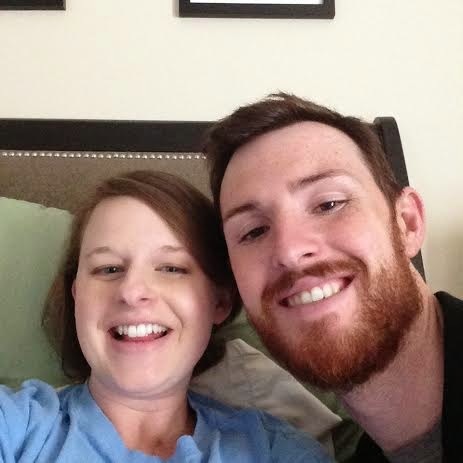 Best Part of these Weeks: Kyle getting to feel the baby kick for the first time! Passing my Glucose Test, praise be! 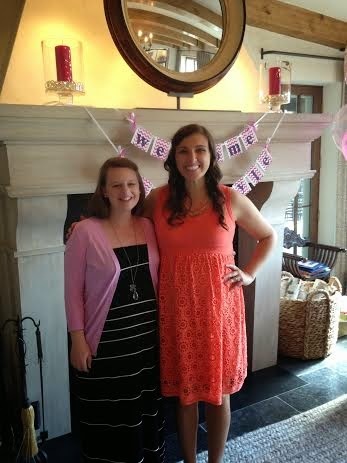 Getting to see my college bestie, Beebs, and celebrate her and her sweet daughter-to-be (we're due a day apart!) at her shower last weekend. 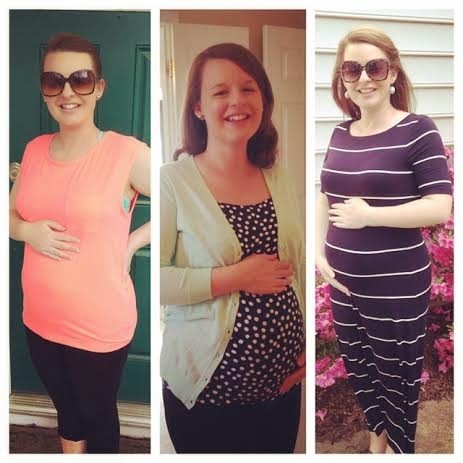 And, my first Mother's Day (as a mother-to-be)! Kyle and I had seen an article about doing a Mother's Day journal instead of a card every year, and I had commented how awesome of an idea I thought that was! Sure enough, that sweet boy listened and surprised me with a beautiful journal and first entry on Mother's Day morning! I am so excited to see that thing fill up over the years. Whew! Glucose Test passed! 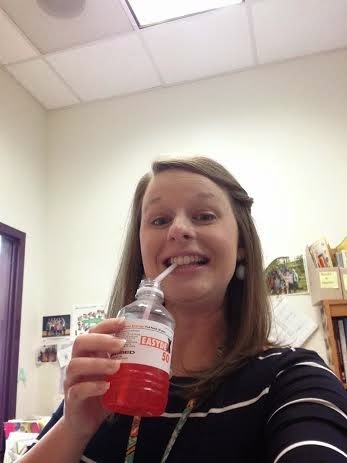 Chugged that down at 2pm in my office at school! My students were so curious about the drink! I love getting to share part of my pregnancy with them...they are just so innocent and sweet and cute! Will forever cherish this Mother's Day journal! I loved getting to shower Beebs and her sweet baby girl in Baltimore! Being pregnant with her has been one of the biggest blessings! I love that our babies will grow up so close in age--we're secretly hoping they'll be bday twins! Can't Wait For: Two baby showers in May (one at school and one in my hometown! ), our 28-week appointment (always love hearing that sweet heartbeat), and making more progress in the nursery! The Mother's Day Journal is such a wonderful idea! Go Kyle! You look so good! 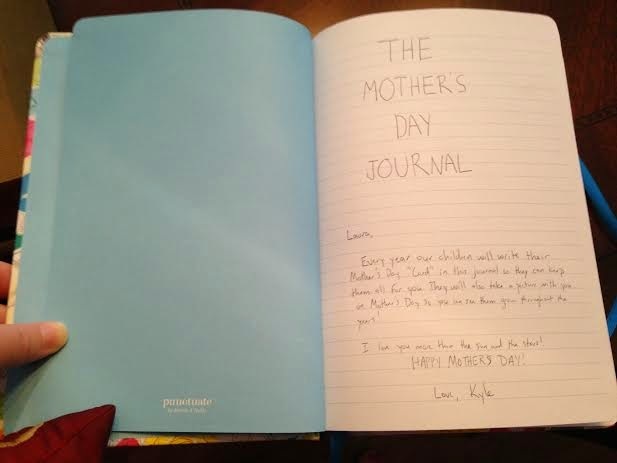 The Mother's Day Journal is such a sweet idea--maybe I'll steal that one day. Can't wait to find out his name! © 2014 - Laura Barkley - Lu & Co.